Oil on canvas, 18 x 20 in. Millard Sheets is a major name in California art, the result of his precocious talent and his incredible energy. 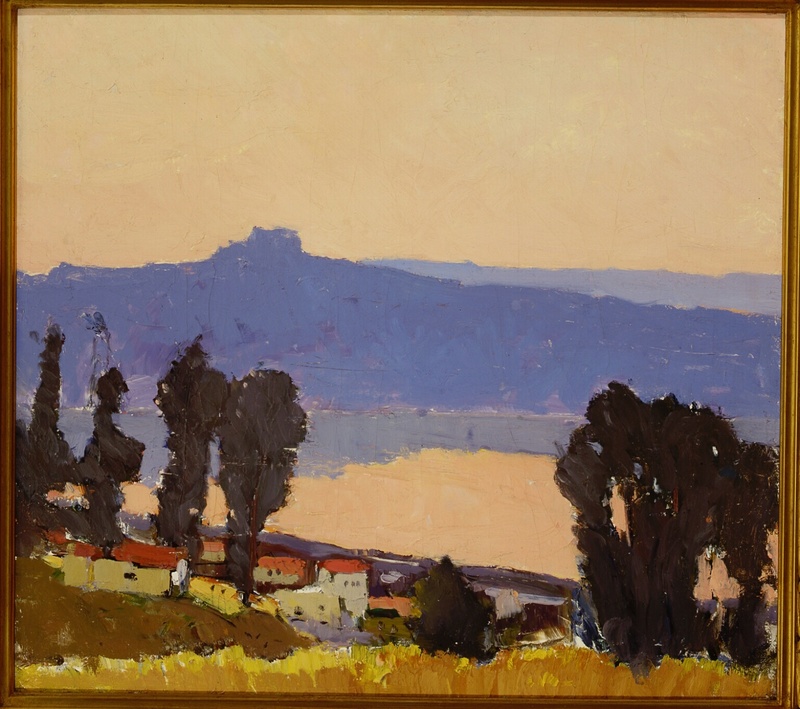 In the mid 1920s while still a student at Chouinard Art Institute in Los Angeles, he and fellow art student Ben Messick, later to make a name for himself as a painter of social realist themes, went out sketching at Silver Lake, one of the City of Los Angeles’s reservoirs located in the Hollywood hills a few miles east of downtown Hollywood. At that time the hills bordering Silver Lake were dotted with only a few homes -- such as the Spanish-style red-tile roofed structures in the painting’s foreground -- and the water and brush-covered hills formed a kind of wilderness oasis in LA’s suburban sprawl. The pink dawn shows how incredibly early the two painters arrived on scene. Easels set up on the Lake’s west side looked into the sun making the foreground eucalyptus and the hills on the east side of the lake mere silhouettes. In the mid 1920s Sheets was working in a broad-brushed post-Impressionist style and in oil, although most of his later artworks are in watercolor. On return from the painting excursion, Sheets left the painting with the Messicks and it was purchased from Mrs. Messick who related the story of its creation. Exhibitions: Carnegie Museum of Art, Oxnard, Ca. CaliforniaArt.com © copyright 2007 Dustin Publications.